Bernard Sindall's work has a charm, wit and bawdy humour that make it both unmistakeably English - and thus part of a tradition that has its roots as much in 'low art' as in 'high' - and also undoubtedly his own. 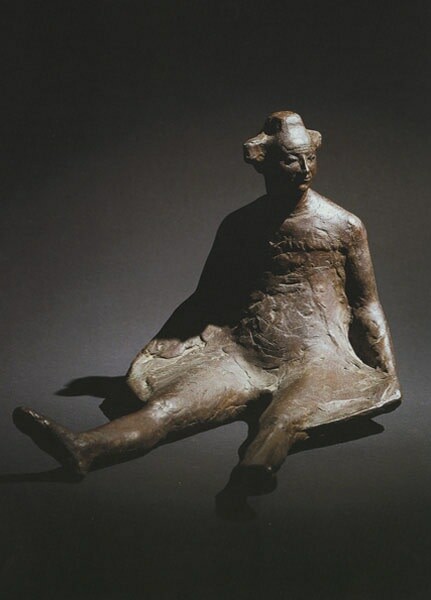 Unlike a good deal of other sculpture of the human figure, his subjects seem full of life. They are are overweight, mischievous, imperfect, embodying conflicting thoughts and thwarted ambition. Something in their stance and expression seems to challenge the viewer to regard themselves with the same objectivity. From 1950 to 1952 Sindall spent two years in Italy, courtesy of the Prix de Rome, where he studied the work of the great masters whom he admired most, from Donatello through to near-contemporaries such as Medardo Rosso and Giacomo Manzu. He first exhibited at the Palazzo Venezia in Rome in 1951 and showed frequently both in England, particularly at the Royal Academy (where he was elected as an Academician), and abroad, in Italy, Switzerland, America & Norway. He also built a strong reputation through public commissions, both as a sculptor and a medallist.